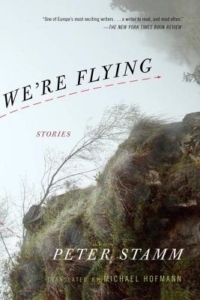 We’re Flying, an excellent new collection of short stories by the Swiss writer Peter Stamm, is the author’s eighth book to appear in English. As with Stamm’s previous works, it is the poet and essayist Michael Hofmann who handles the translation, a task I imagine to be both more complex and more straightforward than Hofmann’s other translation projects (Franz Kafka, Joseph Roth, Thomas Bernhard). This is because Stamm is one of the leading new voices from Europe, but his sharp and unadorned prose is very different from what we might usually expect from contemporary European fiction. There are no winding sentences, no high modernist conceits, no long disquisitions on Nietzsche or Nicholas of Cusa, and little trace of the towering figures of Central European fiction (Kafka, Heinrich Von Kleist, Robert Walser). Stylistically the stories are closer to an American writer like Raymond Carver. Yet in the subtle unfolding of psychological dramas both grand and everyday, and in the way tradition weighs on the present, Stamm does bring the gravity we (or at least I) associate with serious modern European fiction. It is both a testament to Stamm’s use of the short story medium and Hofmann’s capacities as a translator that these two elements — the psychological drama of everyday life and broad philosophical themes of the European tradition — are seamlessly held together. The protagonists of We’re Flying represent a pretty wide swath of contemporary Swiss society. The collection includes two standout stories concerning village priests whose faith is stretched in different directions. In “Children of God” Michael, deeply suspicious of the many “Communist” village folk shrinking the ranks of his congregation and undermining the conditions of belief, learns of an alleged immaculate conception by a waitress named Mandy. At first Michael is skeptical, but soon he is convinced that Mandy is telling the truth and develops a kind of love for her. Michael’s new devotion is a compromised and highly idiosyncratic version of faith (some would call it sinful), but one that surprisingly establishes a shared space for Communists and believers to participate in Mandy’s pregnancy. This is not a cheap reinsertion of something transcendent into our thoroughly secularized world to show a community ultimately based in Judeo-Christian belief. Indeed, in “Holy Sacrament” a priest reaches the opposite conclusion after stepping up to the pulpit and realizing that not a single person has shown up to Communion. Like many of the stories in We’re Flying, the truth or falsity of what people believe is not the issue in these two stories, nor is there a tidy, moralistic conclusion. Stamm is much more interested in showing what it looks like when people take an action to try to break out of their malaise. Sometimes this brings them some clarity, but this is more often than not a temporary condition, and they are simply graduating to some new state of perplexity. Most of the stories in We’re Flying depict more quotidian anxieties than a crisis of faith. In “Sweet Dreams” (which appeared in the New Yorker), a young woman is trying to adjust to “adult life” after moving in with her boyfriend. Small decisions like buying a corkscrew become magnified and she begins to see threats all around to her fledgling attempts to build a home. In “Seven Sleepers,” an austere farmer named Alfons agrees to turn over some of his land for a rock concert. He becomes interested in one of the organizers, a teacher named Lydia. “She was no beauty, she was small and stoutish, her hair was cut very short, and she had bad acne on her face. But she had a nice way with her, and her voice was beautiful and warm.” Lydia ends up at Alfons’s house, and we see how little space he has left in his life for meaningful human connection. In both stories Stamm is able to sketch out the limits of these people’s worlds, or we see what happens when the world starts to press in on them in certain ways. Alfons’s struggle to work against his isolationist habits in small gestures like lending Lydia a dry t-shirt is riveting drama. Another strength of the collection is the inclusion of stories of people in indeterminate conditions, looking back at their foreclosed futures as artists, explorers, naturalists, or romantics. “The Hurt” ends in an apocalyptic flourish when the narrator realizes that a life deferred for his childhood love has dead-ended with his beloved working at a bar with a “good vibe” and involved with a ski bum named Elio. There is little space to carry their commitments through to the end, but like a good Beckett character these people must go on nonetheless. It is difficult not to find yourself in many of these stories (it helps that Stamm splits the narrators pretty evenly across genders and social positions . . . save minorities, but this is a reflection of the fairly homogenous Swiss locales in which the stories are set). A lot of labor clearly went into the crafting of We’re Flying — economy is a difficult skill these days. The result is an effortless accumulation of small gestures that furnish the spaces in which the understanding of ourselves and others becomes possible, albeit in a fleeting manner.